The Dell PowerEdge C5220 system consists of the C5000 chassis and the Dell PowerEdge C5220 compute sled. There are two options, a single-width form factor that supports two 3.5-inch drives for the 12 compute sled version, and a double-width platform supporting four 2.5-inch drives for the 8 compute sled version. A minimum of four compute nodes can be installed in the C5000 chassis with the remaining slots occupied by blank sleds. The 3U C5000 chassis features six fans and redundant 1400w hot plug power supplies, also with two fans, are shared by the servers to keep everything cool, enhancing energy efficiency. The Dell C5220 microserver is designed for scale-out and easy maintenance within the C5000 chassis. Each microserver is individually serviceable and can be configured independently of the other servers in the same chassis. With 12 sleds the system features four times the density of three traditional 1U chassis. Administrators can choose from a single Intel Xeon E3-1200 series processor or one of two Core i3 2120 or 1220L processors. Each node supports four memory slots and a maximum of 32GB. Administrators can choose from 2GB, 4GB, or 8GB unbuffered (UDIMM) memory modules supporting speeds of up to 1333MHz. This microserver will support either 4TB SATA or 6TB SAS. Using SATA drives in all 12 slots provides up to 48TB of storage with all microservers hosting 4TB. Controlling the hard drives is an integrated Intel C204 or an optional LSI 2008 SAS mezzanine card option. 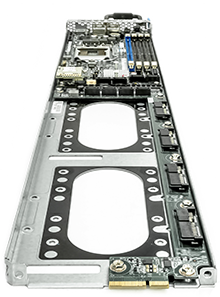 There is a single 1 x8 PCIe mezzanine card slot that is only present on the 8-sled chassis version. Network communications are handled by an embedded NIC/LAN on motherboard (LOM) with each C5220 supporting two Intel 82580 DB Dual 1GbE controllers for independent Ethernet. Management of each server is provided by the embedded Baseboard Management Controller (BMC) with Intelligent Platform Management Interface (IPMI). Administrators can connect to the system either directly from the shared NIC port on the front of one of the compute sleds or through the RJ45 connector on the chassis. The hyperscale design is extremely efficient providing 4x the density of three traditional 1U servers and reducing cooling costs by 75%. It also packs some serious processing power with up to 12 Intel Xeon processors in a 3U chassis.